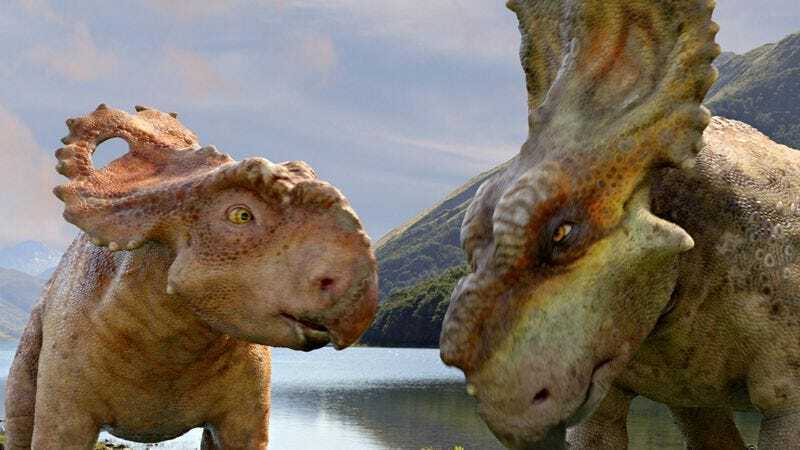 The 3-D animated family film Walking With Dinosaurs shares a title and a production company with an acclaimed BBC miniseries, but it’d be a major mistake to confuse one for the other. The small-screen version, which first aired in 1999, had the novel idea of giving CGI dinosaurs their own nature documentary, “observing” them in the same way a National Geographic special observes penguins or wildebeest. Originally, this big-screen extension of the Walking brand was going to adopt the same approach, just on a grander scale. Along the way, however, someone apparently reasoned that kids wouldn’t sit still for a movie in which dinosaurs—those amazing, captivating occupants of ancient Earth—don’t have nattering conversations, or learn important life lessons about bravery. And so here’s the new, but not improved, Walking With Dinosaurs, which not only saddles its prehistoric attractions with sassy banter, but also inserts them into an impossibly generic coming-of-age adventure. Were he real, John Hammond might approve of such hucksterism. As if anticipating the patronage of slightly-too-old-for-this adolescents, the filmmakers supply a framing device in which a talking bird introduces a bored teenager to the wonders of the Mesozoic Era. (Here’s hoping Karl Urban, who plays the kid’s paleontologist uncle, got paid handsomely for his day or so on set.) Narrated by the feathered guide (John Leguizamo, in warmed-over Ice Age mode), Walking With Dinosaurs focuses on the plight of a young Pachyrhinosaurus, voiced by a plucky Justin Long. Narratively speaking, the film is less indebted to The Land Before Time than to Bambi, from which it borrows a raging forest fire, the death of a parent, and a bit of spring-fever romance. Curiously, only a few dino species even make appearances, with the Gorgosaurus filling the toothy, fearsome adversary quota. There are, however, plenty of poop and vomit jokes (for the very young) and pop-song montages (for the musically indiscriminate). Admittedly, the effects work is pretty strong. Directors Barry Cook and Neil Nightingale place their scaly, hyper-detailed creations against actual, physical backdrops, seamlessly immersing fake fauna in real nature. But given how quickly CGI tends to age, that’s a transient triumph. (Character designer David Krentz also worked on Disney’s Dinosaur, whose effects have—to put it kindly—not held up so well.) As a teaching tool, the movie is especially suspect: Though the filmmakers flash the full names of the dinos on-screen, such interest in classification—and in getting kids hooked on natural history—feels like a begrudging afterthought. Not that anyone should look to this lazy underdog story, starring anthropomorphized animals saying things like “We should have brought more layers,” as a source of hard science. Instructive mainly for screenwriters looking for tips on what not to do, Walking With Dinosaurs takes the education out of “educational entertainment.” The entertainment, too.